8.12 points at 34 votes (rank 62). Skating was very hip in the 80s for the youth. So the company Electronic Arts was full in line with the trend at the end of 1987 when releasing Skate or Die!. The game offers the possibility to compete in up to five disciplines either alone against three computer opponents (with different strengths) or against up to seven more human players. Before the start of the game, the game settings need to be selected in the skate shop. All players can enter their names via the "Sign-Up" function with the keyboard and then choose the colour of their board, except for black all colours of the C64 are available. With "Cancel" you end the sign-up. Then you skate out of the shop and choose if you want to play all disciplines or single disciplines (or practice if "Go Practice" is selected). In the Skateshop you can set the number of players per sign-up and enter the names (1), choose the board colour (2) or view the highscores (3). When you have made your choice, you either select "Go Compete" or "Go Practice" to leave the shop and choose the discipline with the skater by skating through the corresponding street. 1st discipline: Freestyle Here you have to do tricks after skating up the ramp and before going down again - you can do anything from the simple turn to figures such as "Ollie Air", "Handrail" etc. Timing and precise controls are crucial, otherwise you break your neck just as spectacularly as in real life as shown in the picture and can collect your bones afterwards. 2nd discipline: High Jump Here you need to pick up as much speed - which leads to increasing height - as possible by shaking the joystick. The player skates back and forth five times maximum. If you think that you have reached a good height, you should signal that you are satisfied by pushing the fire button. If you miss this moment you will come a cropper (see image). If you don't ever push the button, the last try counts. 3rd discipline: Race Mastering the downhill race parcours in a good time without too many crashes is the main mission. But jumping over or skating through sewage pipes, jumps from ramps or over obstacles will be awarded not only with respectful comments but also with a significant amount of bonus points. If you fall on your nose, the laugh will be on your side. 4th discipline: Jam Not only speed counts in this race through backyards and side streets. By different kicks and punches you can also maltreat the opponent or the surrounding. If one player is far ahead, the one trailing is quasi beamed to the front in return for a time penalty. But even with an inferior time you can win by a higher score. 5th discipline: Pool Joust In this rather violent discipline one of the competitors is always equipped with a kind of paddle for five turns through the pool, trying to know the opponent from his skateboard. If the hunted player avoids the paddle skillfully five times, he will receive the paddle. To "paddle someone", the player that carries the paddle has to press the fire button at the right moment. Both the hunter and hunted player can delay the re-entering of the pool at the rim by moving the joystick in the direction of the pool edge. The audiovisual design at that time left only little to be desired and used the possibilities of the C64 very well. The title screen and music by Rob Hubbard caused some jaw-dropping right at the beginning. And unlike many other games with fancy title music and graphics, the quality of graphics and sound stay at a very high quality throughout the game, from the skate shop to the single disciplines. Unfortunately, all this high quality performance of every single discipline each of which has own animations and an own ingame music in two voices (one voice stayed reserved for the FX) resulted in extremely long loading and various disk flippings. So you have to suffer a little to enjoy all the many details such as detailedly animated and all in all very freaky sprites, soft scrolling at the downhill disciplines or also many saucy words. Note for people interested in sound: The unique, sappy guitar samples in the title screen illustrate that the newer 8580 SID chips (without modifications/SID hack) are not capable of playing certain tunes - especially those including digis - designed for the 6581 series. Moreover, Electronic Arts - being a US company - created the game for the American market, which means for NTSC-Standard. Since an NTSC C64 is slightly faster clocked than a PAL system established in Europe, the Skate-or-Die! music runs noticably slower on PAL systems. PAL users interested in the difference might want to listen to the HVSC-SID file linked in the upper right with a SID player, to hear the music at NTSC speed. In the Downhill disciplines (Jam and Race) every player is asked if he prefers "Regular" or "Goofy Foot" as controls. The difference is best explained like this: When choosing Regular Foot you control from the view as you look on the screen, so left is "left", "down" speeds up, "up" is to brake. When choosing Goofy Foot on the other hand, you control from the Skater's perspective. Left and right are swapped, speeding up is now "up", braking is "down". But beware: With pressed fire button, the controls are identical in both modes, e.g. at the race you duck with both the "Regular" and the "Goofy" with "down+fire" (for tunnels and high barrier) and you jump with "up+fire" (required for most of the obstacles). Emulator players be aware that program parts are permanently reloaded, so for example when using VICE, switch "True Drive Emulation" ON and "Virtual Device Traps" OFF, unless you play the Avatar version. Some versions are either flawed or not easily transferable to let them run on a real C64. There is no solid singlesided and/or fastloaded version. A small list of versions with their features follows. There are various ESI versions all of which seem a little complicated to transfer. If you use a real C64, try formatting the disk with Disk ID "EA" before transfering the image. The ESI/Hotline Version seems most recommendable of the ESI versions, here (forum64.de, posting #9) you find one with a virgin highscore list. You get some tips (next to the usual sayings) from the owner of the Skate Shop, if you let the joystick rotate there a bit. A detailled and at the same time clear manual for the game in German by H.T.W with hints for the controls are on C64Games.de (see below -->Links). In the darker areas of the halfpipe (quasi in the bends) you can pick up speed by pressing the fire button. The simple Kickturn/turn without a jump results in more points, the longer you wait with the execution after you have stopped to board on the edge. When doing "Handrail" you get more points if you stay in the handstand as long as possible. If you do an Ollie Air/turn in the air, the board has to stand in an angle that runs parallel to the ramp when reentering, so you do not fall. The more turns you can make, the more points you get. On the left side of the ramp you cannot do any figures in the gray area in the middle. Every try will end in a fall. You can improve the result by moving the joystick in circles instead of jolting left and right. If you are happy with about 10.000 points, you should prefer the left side of the screen. Jump at the skull, then through the tunnel (duck until you are out), then jump in the shop terrace, drive through up to the ramp, jump. If necessary jump over the block/stone, do not take the last bend, but jump over the green corner. The difference of points between the first and the second skater on the finish line is often very small. Therefore you should set no great store by speed. What counts is to re-design your environment as often as possible by kicks and fist punches (kick away garbage bins, skate over green garbage, cause a short circuit in fuse boxes (?) and of course make the opponent fall. For this you always have to be in viewing direction to the opponent. If you look to the left, but the opponent is to your right, then you'd better do a jump (Regular Foot "up and fire") fast, as aftwards you always land with the viewing direction turned by 180° . A hit already counts 200 points, if your opponent falls, you get even 500 points. You can also reach that by placing your own board in front of him (out of his kicking reach) and quasi "leave him stranded". Absolutely avoid: fences, open manhole covers, air shafts and similar obstacles. Attack: If you yourself hold the paddle at the beginning of the duel, it is essential to start at the right moment to place yourself directly behind the opponent and make him fall just at the first tour through the pool (s. image further at the top). If you have mulled four attacks, it is very risky to do the fifth. When the paddle changes the owner at the wrong point of time, the previously pursued player will probably hit it around your ears right away no matter whether your enemy is human or computer controlled. Defence: When playing the skater without the paddle, you should choose your starting position tactically. Against weak opponents it is recommendable to change the course as often as possible, so that you stay out of reach of the paddle. Strong opponents could look through that strategy, however. None known, but all disciplines can be trained. Caution, spoiler! There are various Easter Eggs, e.g. in the shape of a "hidden" path in the race. In Jam there is the possibility to drive a kind of "shortcut" after a mesh wire fence at the left border of the screen. TheRyk: "Although there are multi event sports games with more disciplines and the loading times were rather long, many gamers name Skate or Die! among their favourites of this genre, so do I. The single disciplines have all been worked out with much love for detail. The music is mostly good, some tunes are even better. I do not like all disciplines to the same extent and most players might need some practice to get used to the controls. But even today I like playing it with friends, and be it only Pool Joust all night long. 8 to 9 points (of 10) are deserved in my opinion." mombasajoe: "Solid, technically flawless skater game. There is probably not much more to get out of this topic. A game that you like taking out of the shelf every now and then 8/10." 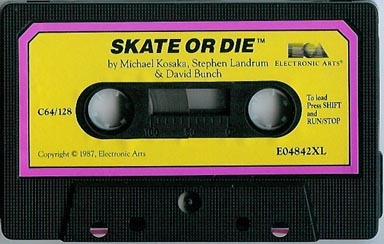 In 1990 the sequel Ski or Die was released which was, however, by no means as successful as Skate or Die!. In 2009 the game "Skate 2" for the PlayStation 3 and the XBOX360 was released, which contained a "Skate or Die!" T-Shirt (the Skate or Die! logo on black background). Unfortunately, there is no highscore possible in this discipline. This page was last modified on 16 February 2019, at 07:56.